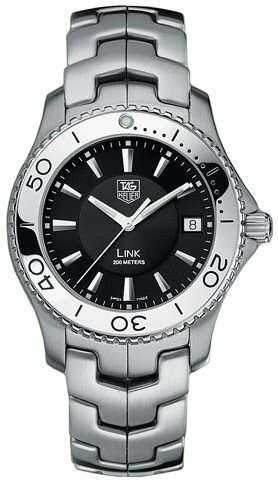 From TAG Heuer's recently updated Link series comes this elegant blend of sport and prestige styling. The perfectly round black dial has a classic, uncluttered look. It sports a monochrome TAG Heuer logo and offers three-hand function with luminous hands and markers as well as a date window at the three o'clock hour. Framing the dial is a rotating bezel crafted from polished steel and finished with attractive coin-edge detailing. The bezel's engraved dive time scale and unidirectional motion allow safe timing of dives and other limited events. The watch is set in a 40 mm brushed steel case and presents on a handsome brushed steel link bracelet with smooth contours and flowing lines. The bracelet fastens with a fold over with safety clasp for added security. Other notable features of this watch include precise Swiss quartz movement, a screw-down crown and caseback, and a curved scratch-resistant sapphire crystal. This Link series watch is water-resistant to 200 meters. I bought this for my husband without him seeing it first and he loves it.